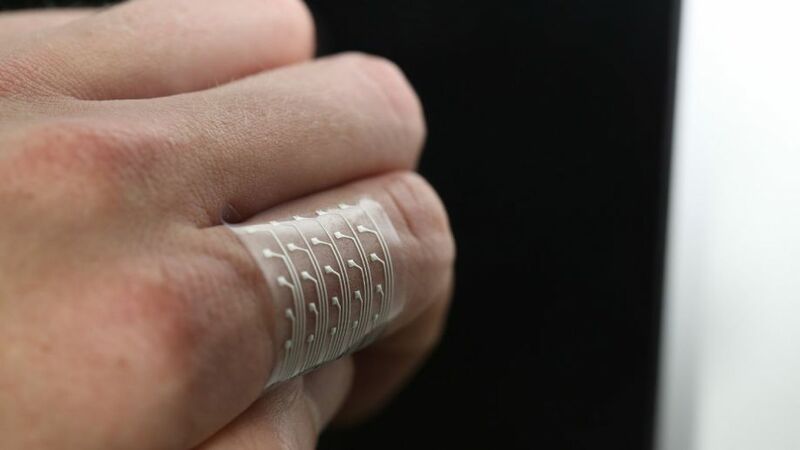 New method combines precision printing of stretchable conductive inks with pick-and-place of electronic components to make flexible, wearable sensors. Human skin must flex and stretch to accommodate the body’s every move. Anything worn tight on the body must also be able to flex around muscles and joints, which helps explain why synthetic fabrics like spandex are popular in activewear. 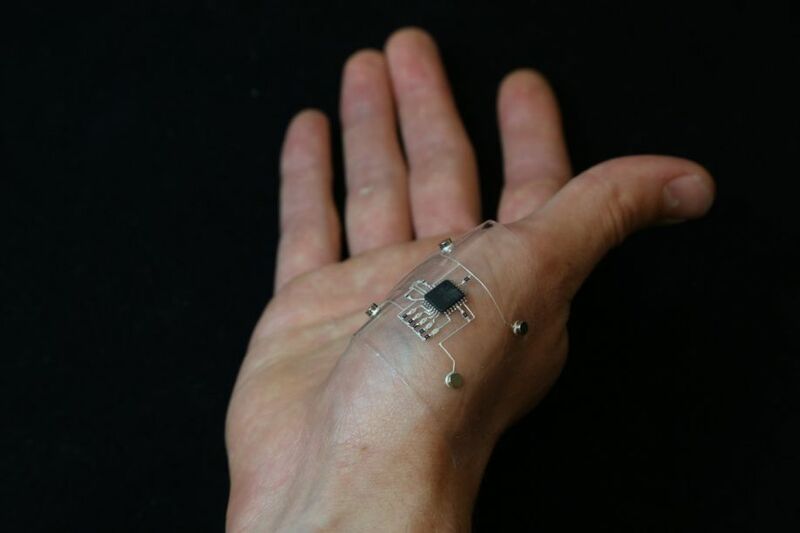 Wearable electronic devices that aim to track and measure the body’s movements must possess similar properties, yet integrating rigid electrical components on or within skin-mimicking matrix materials has proven to be challenging. Such components cannot stretch and dissipate forces like soft materials can, and this mismatch in flexibility concentrates stress at the junction between the hard and soft elements, frequently causing wearable devices to fail. Now, a collaboration between the lab of Jennifer Lewis, Sc.D. at the Wyss Institute for Biologically Inspired Engineering at Harvard University and the Harvard John A. Paulson School of Engineering and Applied Sciences (SEAS) and J. Daniel Berrigan, Ph.D. and Michael Durstock, Ph.D. at the US Air Force Research Laboratory has created a new additive manufacturing technique for soft electronics, called hybrid 3D printing, that integrates soft, electrically conductive inks and matrix materials with rigid electronic components into a single, stretchable device. “With this technique, we can print the electronic sensor directly onto the material, digitally pick-and-place electronic components, and print the conductive interconnects that complete the electronic circuitry required to ‘read’ the sensor’s data signal in one fell swoop,” says first author Alex Valentine, who was a Staff Engineer at the Wyss Institute when the study was completed and is currently a medical student at the Boston University School of Medicine. The study is published in Advanced Materials. The printing process causes the silver flakes in the conductive ink to align themselves along the printing direction so their flat, plate-like sides layer on top of one another, like overlapping leaves on a forest floor. This structural alignment improves their ability to conduct electricity along the printed electrodes. “Because the ink and substrate are 3D-printed, we have complete control over where the conductive features are patterned, and can design circuits to create soft electronic devices of nearly every size and shape,” says Will Boley, Ph.D., a postdoctoral researcher in the Lewis lab at SEAS and co-author of the paper. Soft sensors composed of conductive materials that exhibit changes in their electrical conductivity when stretched (which is how they detect movement) are coupled with a programmable microcontroller chip to process those data, as well as a readout device that communicates the data in a form humans can understand. To achieve this, the researchers combined the printed soft sensors with a digital “pick-and-place process” that applies a modest vacuum through an empty printing nozzle (through which ink is normally dispensed) to pick up electronic components and place them onto the substrate surface in a specific, programmable manner. 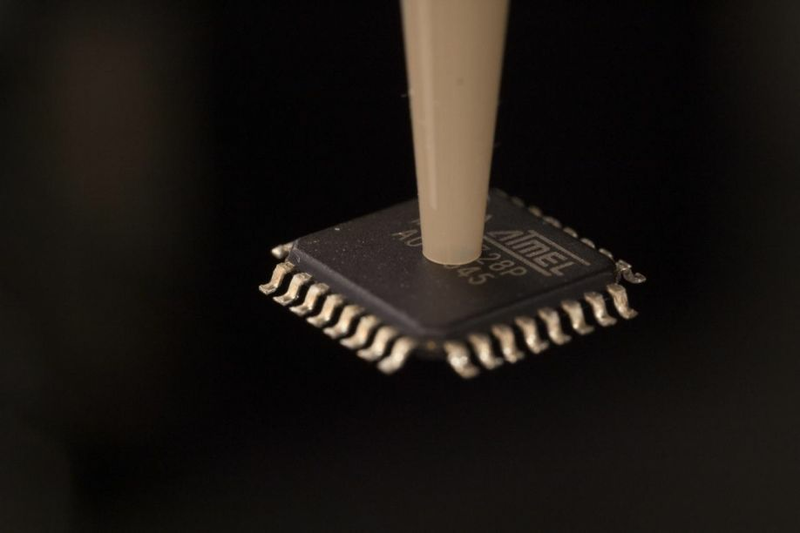 Because these surface-mounted electrical components (e.g., LEDs, resistors, micro-chips) are by nature hard and rigid, the team took advantage of TPU’s adhesive properties by applying a dot of TPU ink beneath each component prior to attaching it to the underlying soft TPU substrate. Once dried, the TPU dots serve to anchor these rigid components and distribute stress throughout the entire matrix, allowing the fully assembled devices to be stretched up to 30% while still maintaining function. A device composed of 12 LEDs attached to a flat TPU sheet created using this method was able to be repeatedly bent into a cylindrical shape without reduction in the intensity of the LEDs’ light or mechanical failure of the device. As a simple proof-of-concept, their team created two soft electronic devices to demonstrate the full capabilities of this additive manufacturing technique. A strain sensor was fabricated by printing TPU and silver-TPU-ink electrodes onto a textile base and applying a microcontroller chip and readout LEDs via the pick-and-place method, resulting in a wearable sleeve-like device that indicates how much the wearer’s arm is bending through successive lighting-up of the LEDs. The second device, a pressure sensor in the shape of a person’s left foot, was created by printing alternating layers of conductive silver-TPU electrodes and insulating TPU to form electrical capacitors on a soft TPU substrate, whose deformation patterns are processed by a manual electrical readout system to make a visual “heat map” image of the foot when a person steps on the sensor. While the team is continuing to optimize both their materials and their methods, hybrid 3D printing is broadly applicable to manufacturing myriad electronic devices. “We have both broadened the palette of printable electronic materials and expanded our programmable, multi-material printing platform to enable digital ‘pick-and-place’ of electronic components. We believe that this is an important first step toward making customizable, wearable electronics that are lower-cost and mechanically robust,” says Lewis, who is the corresponding author of the paper, a Core Faculty member at the Wyss Institute, and the Hansjörg Wyss Professor of Biologically Inspired Engineering at SEAS. Additional authors of the study include Travis Busbee, a graduate student in the Lewis lab and co-founder of Voxel8; Jordan Raney, Ph.D., former postdoc in the Lewis lab and current Assistant Professor in the School of Engineering and Applied Sciences at the University of Pennsylvania; Alex Chortos, Ph.D., and a postdoc in the Lewis lab; Arda Kotikian, a Graduate Research Fellow in the Lewis lab. This research was supported by the Air Force Research Laboratory Materials and Manufacturing Directorate and UES, the Vannevar Bush Faculty Fellowship Program under the Office of Naval Research, a generous donation from the GETTYLAB, and the Wyss Institute at Harvard University.